Stewart R: Whoa Mama!! What a week of glorious comic reading I have ahead of me and I suspect there might be one or two of you out there who’ll be anticipating a bumper week as well. After last Thursday’s light yet entertaining pile I’ve got a veritable tidal wave of illustrated storytelling heading my way and I’m really looking forward to shoving my head betwixt the many sumptuous pages. So let us get on with the Incoming... walkthrough. Should the worse happen of course I can always fall back with some relief upon the soft, comforting pillow of space-based shenanigans that Peter J. Tomasi is weaving over at DC. The blurb on Green Lantern: Emerald Warriors #4 suggests that the plot may quicken and thicken this week as the mysterious villains make a move against the lanterns of Green and Guy Gardner may just start to struggle with simply willing the red rage inside him to stay back. I’ve been very impressed with Tomasi and Pasarin’s work on this title to date, so much so that this is probably my favourite DC universe comic presently. With the other GL titles seeming a little pedestrian or suffering from difficult transitions to new creative teams it’s a relief to see consistency oozing from the newest series of the bunch. Right, I suppose I should mention Batman: The Return of Bruce Wayne #6 which sees Grant Morrison’s time-hopping tale of the Dark Knight’s journey from the distant past to the present finally come to an end... all too bloody late I’m afraid! 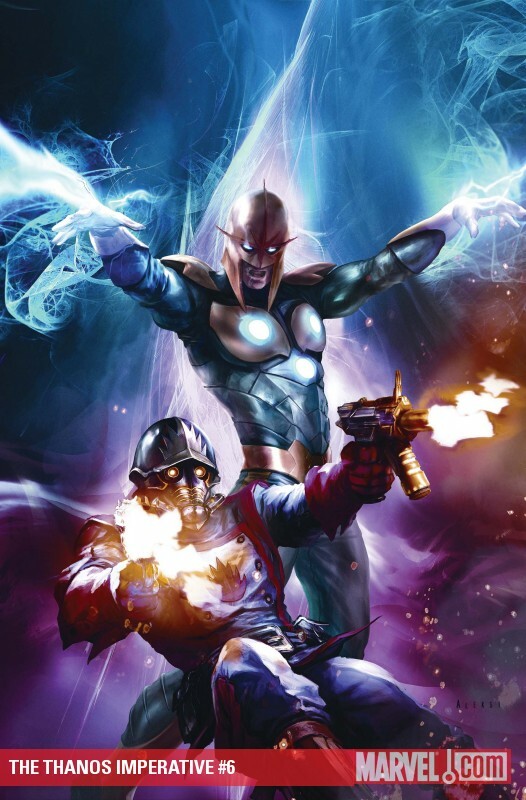 DC had ample opportunity to see how Marvel screwed things up with the Captain America: Reborn fiasco where the official finale was completely overshadowed by delays and then appearances of the returning hero before he was actually back in the lead series itself. With Batman and Robin #16 already having turned things on their head in the Bat world and the internet buzzing somewhat from Morrison’s Batman Incorporated direction I really do predict that the grand finale of Batman: TROBW will probably be a somewhat low-key and disappointing end to a series that showed great promise with issue #1 and then fell away swiftly from there. One particular series that I’m hoping gets a kick in the pants this month is Avengers: The Children’s Crusade which sees issue #3 turn up in shops this week after the standard two month gap. Allowing Heinburg and Cheung the longer break between issues seemed like a good idea when I first heard that they would be working on a Young Avengers book again but now, this far in, I’m feeling a real detachment to the plot and rather begrudgingly feel I should dig out the first two issues again to try to remember what has happened so far. If I have to do this every time a new chapter is released I can see things getting very tired very quickly. Part of me thinks I’d be better off saving up two or three issues at a time and then reading them in one sitting but that surely then just supports the argument that I should bide my time and then buy this as a trade and enjoy the whole thing in one go. But then if I did that I wouldn’t find out what part Doctor Doom is going to play and I’m not sure I can wait! Gah, why must reading comics be so hard?! Hahahahah, great isn’t it? 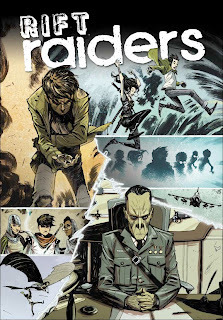 I've all of my fingers crossed that Wednesday marks the release of the latest collaborative effort from Mark Sable and Julian Totino Todesco in the form of the Rift Raiders OGN from new kids on the block, Kickstart Comics. Sable and Todesco created one of my favourite conspiracy theory comics of recent times when working on Unthinkable for BOOM! and from what I've seen of this time-travelling adventure so far I think we might just be in for another helping of high quality action. It's also good to see a new publisher emerge in these financially trying times and I'll certainly be keeping an eye peeled to see what they are bringing to the table. Image are a publisher flying high at the moment and they have a couple of choice offerings this week. Cowboy Ninja Viking #10 comes out to play, throwing up more multiple personality madness as Duncan and his ‘Triplet’ cohorts continue to bicker, fight and make up all over the globe. The announcement this week that Disney are moving forward with plans to bring CNV to the big screen should get this excellent comic a bigger readership and well deserved it will be too. Of course the cibopathic tendencies of one Tony Chu may well be heading to a screen near you - either in your lounge or possibly your local cineplex - soon enough and Chew #15 is likely to mark the quarter point of John Layman and Rob Guillory’s crazy crime story and potentially mark it with a bang. 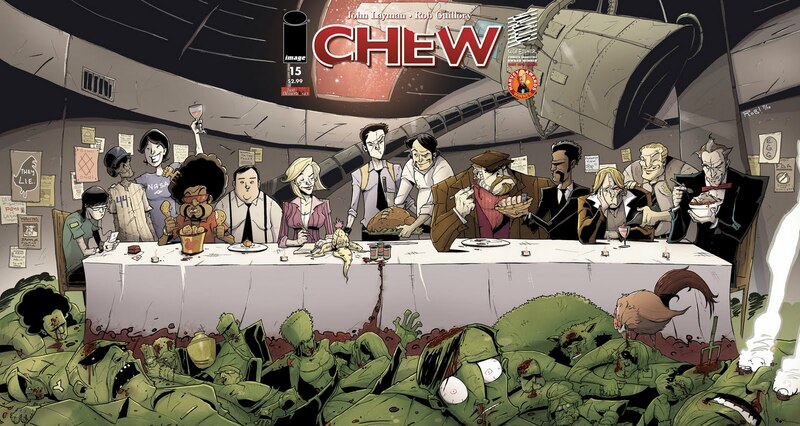 The even better news is that this is a bumper sized issue but with the standard $2.99 price AND it comes with a neat ‘Last Supper’ style tri-fold cover!! Everything there points to a win! It’s time to start winding this up but I really should mention Amazing Spider-Man #648 for not only does it mark the beginning of Dan Slott’s reign on one of Marvel’s premiere titles but also the point where Humberto Ramos returns to pencil the webbed wonder. Ramos is one of the reasons that I got back into comics back in 2003 with his breathtaking run on Spectacular Spider-Man and and I’m relishing the chance to see him return to capture further events in Peter Parker’s life. This is the Big Time folks, let us enjoy it!